As I explained in an earlier post, we recently started eating a Paleo diet for medical reasons. It is going well so far - my son and I are both feeling better, and my husband (who has no health problems!) has more energy. Basically, Paleo means eating lots of fruits & veggies, lean meats and fish, eggs, nuts and seeds...but no grains, dairy, or processed foods and only small amounts of natural sugars. The transition hasn't been too difficult for us. So far, I have mostly been using regular recipes - both old favorites and new ones - with some minor adjustments. We eat a lot of meals with fish or meat and two veggie sides. My younger son (who doesn't need this diet for medical reasons) occasionally begs for pasta - in fact, we'll have a dish made with whole wheat penne after my older son returns to college today - but otherwise, no one feels too deprived. It's been hardest on my college son, who is the sickest and on the strictest diet. He misses all his old favorites, but is glad to be feeling so much better! Since our weather has still been mostly cold and wet, I made a nice soup last week, Sausage Soup with Spinach and Wild Rice. We'd had it once before, many years ago, and I remembered it when I was looking for recipes with wild rice. Wild rice isn't actually rice - it's a grass - so it affects the body differently than grains do. My son's dietician gave it the OK for him, and I thought it might help fill a void for any of us missing our grains. The soup was delicious, just the thing for a cold spring day. I didn't need to make any changes other than to make the Parmesan cheese at the end optional for those of us who can't eat dairy. My son was home from college this week for spring break, so I tried to make a wide variety of foods with great flavor to counteract the blandness of his special meals in the dining hall. 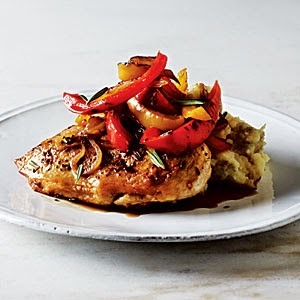 He had a friend over for dinner one night, and (with my husband out of town) I served the three teen boys grilled pork chops, roasted cauliflower, and another wild rice dish, Minnesota Wild Rice Pilaf. The whole meal was a big hit! Our guest told me he normally doesn't like cauliflower then ate three servings of it! His mom sent me a message later asking for the recipe (it was just a simple roasted cauliflower with butter, salt and pepper). The wild rice side dish was delicious. I reduced the amount of mushrooms because my oldest son doesn't like them much but otherwise followed the recipe. One night, I made Roast Chicken with Balsamic Peppers, a dish we'd had one time before, maybe a year ago. I served it alongside roasted asparagus, and my college son raved about the meal! It is a fairly simple preparation but full of flavor, and we all enjoyed it. Another night, I made an old favorite of ours, Cornmeal-Crusted Tilapia. Of course, I couldn't use cornmeal or flour, so I substituted almond flour which makes a nice crunchy coating. Finally, for my son's last dinner at home this week, I made Beef Bourguignonne, another family favorite. I just subbed coconut flour for the wheat flour which worked fine. We normally serve this over whole wheat egg noodles (which I did make for my younger son and his friend). For the rest of us, we tried pureed celeriac which I'd read made a nice substitute for mashed potatoes. Um...no. None of us liked it! So, we ate the meal more as a stew, and it was delicious, as always! I've also been experimenting with baking Paleo, but I'll tell you all about that next week. Now it's time to go make coconut flour/almond flour pancakes. 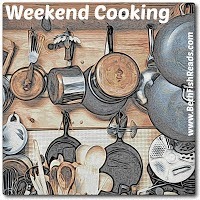 I hope you are all enjoying good food and fun cooking this week! Bummer that none of you like the celeriac. We like it but we don't eat it expecting potatoes. :) I have my eye on that chicken and peppers recipe. Everything sounds so good! How great to have more energy! I'd love to hear how you use/prepare celeriac! Personally, I think the problem was the way it was prepared and the stuff we mixed in to make it "like" mashed potatoes. These all look really delicious. I did not know that fact about wild rice. I have a bag of MN wild rice in my cupboard and you've inspired me. I'm glad to hear everyone feels better on this new eating plan. I have a few friends who have gone paleo for a month or two at a time, and the food photos always look delicious! I'm on a high fruit & veggie diet myself, but I do like a little bit of dairy and the occasional bowl of oatmeal. Otherwise, I might consider it! Hope you enjoy that wild rice, Peaceful Reader! Actually, Cecelia, I do still have oatmeal twice a week or so because I love it AND I feel good with it a part of my diet. And my husband is still eating dairy (I would add a bit of cheese here and there if I could but alas, I am intolerant!). For us, it's not important whether we meet the official definition of Paleo or not (in fact, there are vociferous debates online about the "wild rice issue"!) but that we eat what is best for our own health. So, feel free to explore it if you want to, and make up your own rules! I love that you are reconnecting with old family favorite recipes and paleo-fying them :) You always have tasty recipes to share. Thanks for sharing with #smallvictoriessunday. This week's linky just went live, hope you'll link up again! Sorry it took me so long to visit, i thought I already had. Pinning!